Round trip transportation, admission to both Canada Blooms and the National Home Show, as well as HST. 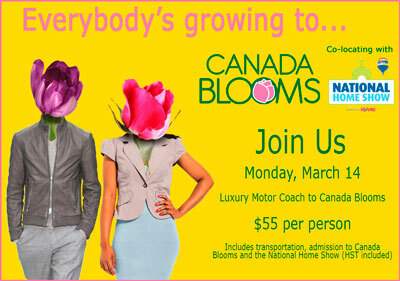 Our society has arranged a luxury motor coach to Canada Blooms on Monday, March 14. The ticket price of $55 per person includes transportation to and from the show location in Toronto, admission to both Canada Blooms and the National Home Show, as well as HST. All participants must bring a signed waiver form (click here) to the bus location on Monday, March 14th. The bus is scheduled to depart from the Elgin West Community Centre, 11099 Bathurst Street, in Richmond Hill at 10:30 am sharp, and will return at approximately 5:30 pm, depending on traffic. For more information about Canada Blooms, click here. Non-society members are welcome to join us!